However along with changing the decor we have been in major clean out mode . We’ve done some major purging and general cleanning and it feels SO good! Most of it we have been able to give to other friends and family who would appreciate the items or we have been able to donate to the local thrift store or to nearby clothing swaps! Very little have we actually trashed. I’ve posted a little about it in my 2014 item purge for 2014! We are doing well thus far! We have gotten rid of almost 600 items! 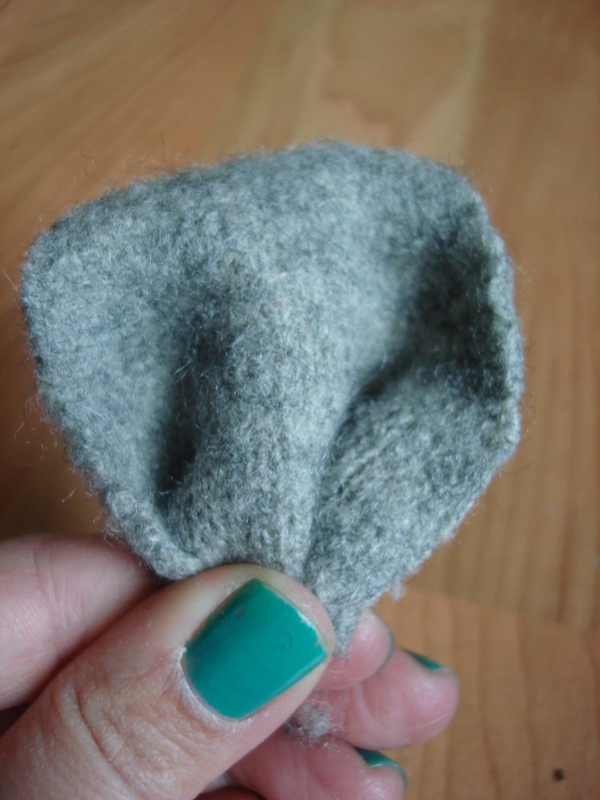 Hubby was cleaning out some of his clothing and he found a pair of wool socks that were a little thin in the toes and had been well felted since they had been through the laundry a few times. I think they had gotten a bit tight too! He put those in the donate/toss pile and I have the hardest time with socks… I hate to see a good pair go in the trash, but most people don’t really want used socks… and I don’t often see them at the thrift store. And most times if one sock has a hole, the other one is perfectly good. What do you do with it? I’ve been wanting to find a way to use them for something! Well, these were wool! I DEFINITELY didn’t want to get rid of these… and they really didn’t have holes in them either. 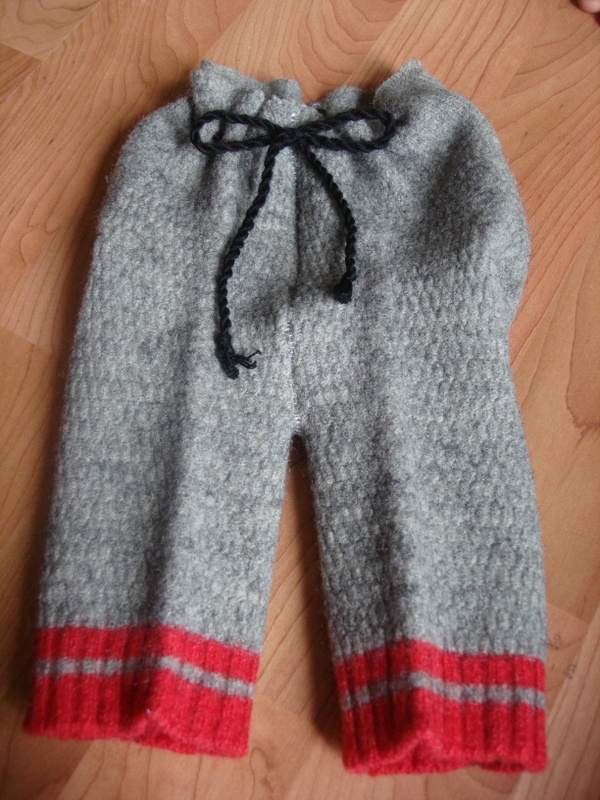 Lately I’ve fallen in LOVE with wool soakers for Xanthie instead of PUL covers for her cloth diapers. Brian has pretty big feet and she still has a relatively small tush… Hmmm… could I make these into soakers??? I CAN! These were super simple to make. They took less than 1 hour to whip up! And.. since they were felted I could cut them with out worrying about them coming unravled! Follow the steps below to make your own pair! 1. Cut from the side of one toe (pinky side) all the way around the toes of the sock to just above the heal on the other side. Basically cutting the top of the sock off of the bottom, but not all the way. 2. On the other sock do the same. 3. Turn the socks inside out. 4. 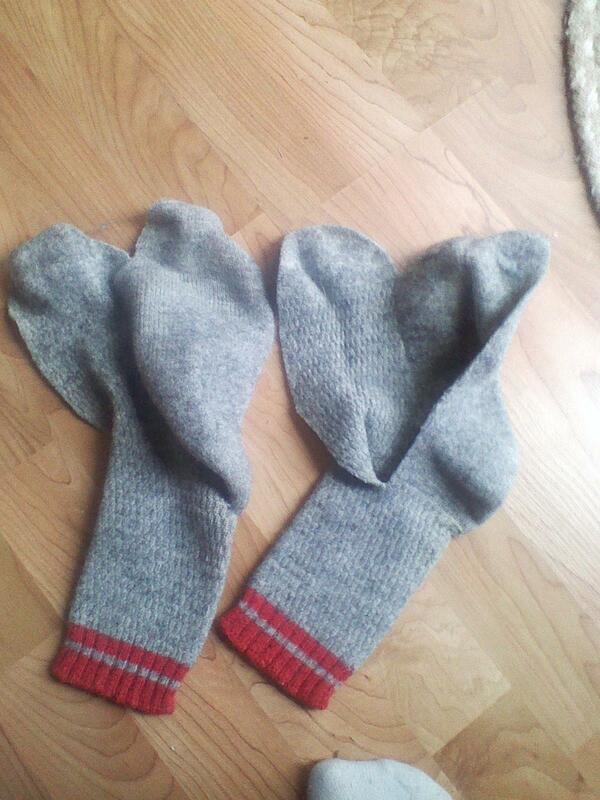 With the right side of the socks facing each other stitch them together. Start at the pinky toe part and go all the way around to above the heal. 6. Trim the rounded toe portion off so that the top of the soaker is even. Cut a little higher in the back to help cover the top of the diaper. 7. Find a string (or twist some yarn together as I did) and a large needle. 8. 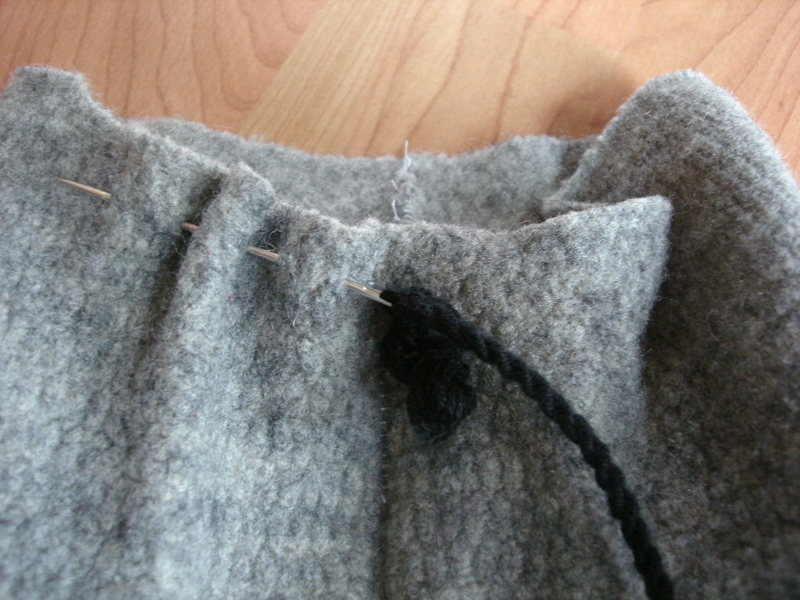 Weave the needle with yarn around the top to use as a draw string. 9. Try them on baby! And see how cute they turned out! or maybe not! Hmmm… if I do this…. Maybe I could put them on a head band for mouse ears or on a baby hat! So there may not be any waist in the end after all! And since there are four toe pieces left and 2 baby girls… perfect! 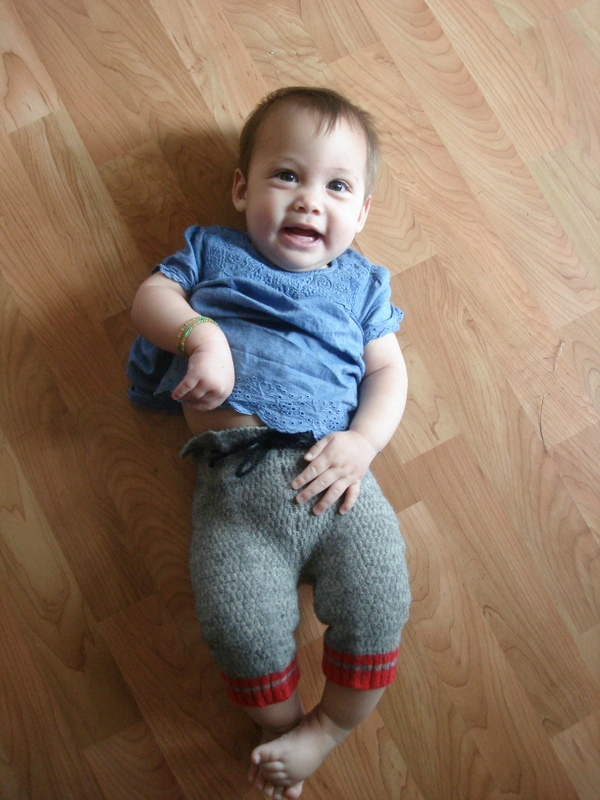 These were men’s wool socks for size 11 feet and now fit an 8 month old 16lb baby tush! A PERFECT reuse of perfectly good wool!!!! Very cute, perfect. You are amazing. Must be so good at time management. Help! Do you have four little ones now? I think you may need to update About Me. Glad to read your blog.